Just a short flight from London and other regional UK airports, the island of Guernsey sits in the English Channel just off the coast of Normandy, France. The second largest of the Channel Islands, Guernsey is home to Britain's cleanest beach, the world's smallest chapel, the Little Chapel, a capital - St Peter Port - said to be the prettiest harbour town in Europe, and 28 miles of picturesque coastline. The setting of best-selling novel and film adaptation, 'The Guernsey Literary and Potato Peel Pie Society', visitors can experience the island that inspired the film on themed tours and at historical attractions and locations featured in the story. From the long stretches of white sandy beaches to the rugged cliffs, Guernsey's ever-changing environment is a haven for lovers of the great outdoors. Walking, cycling, kayaking, and coasteering are just some of the ways to explore the island. Guernsey's sister islands of Alderney, Sark and Herm are a short boat or flight away. Each has its own unique story to tell from the wildlife haven of Alderney to the breath-taking views around the Sark coastline and the unspoilt beaches of Herm Island. Adding in some of the freshest seafood in British waters, Guernsey offers holidays for all types of traveller and a great extension to a trip to the UK, from cultural breaks, to outdoor adventures and family beach holidays, all at less than an hour's flight, or a ferry ride, from the UK. Mike Hopkins, Director of Marketing and Tourism was on the September 30, 2018 "Travel with Stephanie Abrams!" Radio Show in hour 3. 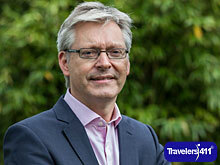 Mike Hopkins has held the position of Director of Marketing and Tourism for VisitGuernsey since November 2013 and has over 30 years' experience in sales and marketing. Mike Hopkins was also on the September 29, 2018 "Travelers411" Radio Show in hour 2.